CUTE YUMMY TIME BENTO COOKBOOK IN URBAN OUTFITTERS! JAPANESE POP CULTURE BOOKS CARRIED BY MAJOR CLOTHING RETAILER. 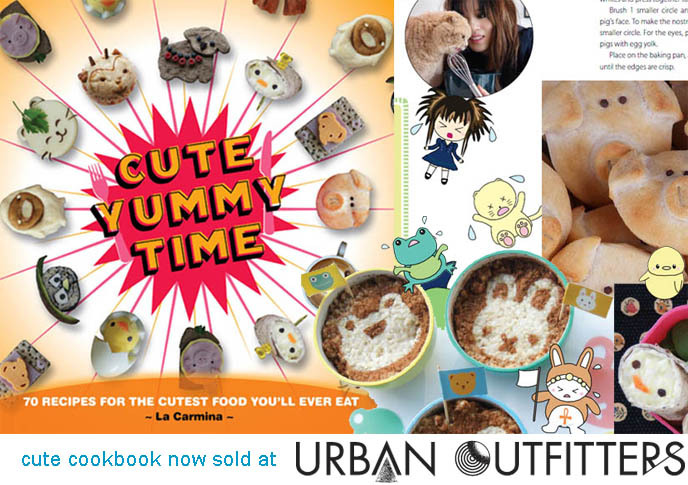 Amazing news: I heard my Japan bento inspired cookbook, Cute Yummy Time, is on display at Urban Outfitters! My book is carried in the NYC stores and other US locations, and coming to Canadian branches soon. You can also see more and purchase it here. 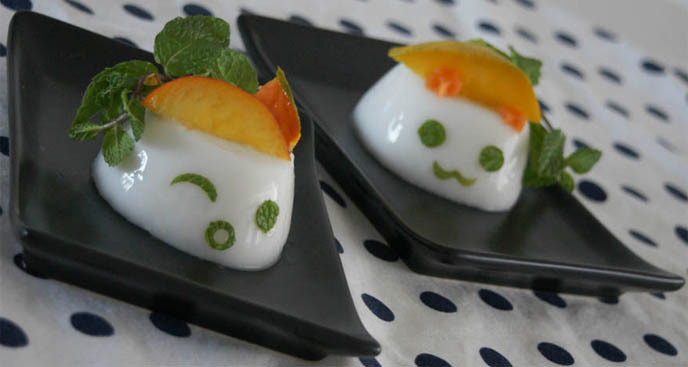 CNNGO published an exclusive, original cute recipe of mine: Winking Coconut Gelatin. Healthy and refreshing — and adorable. Also from the 4-part series: Penguin Onigiri and Tiger Chicken Tikka Masala. There’s info about my cute cookbook on this page — please consider checking it out, so that I can continue to put out books for you! ADORABLE BENTO CREATIONS BY CUTE YUMMY TIME COOKBOOK READERS. 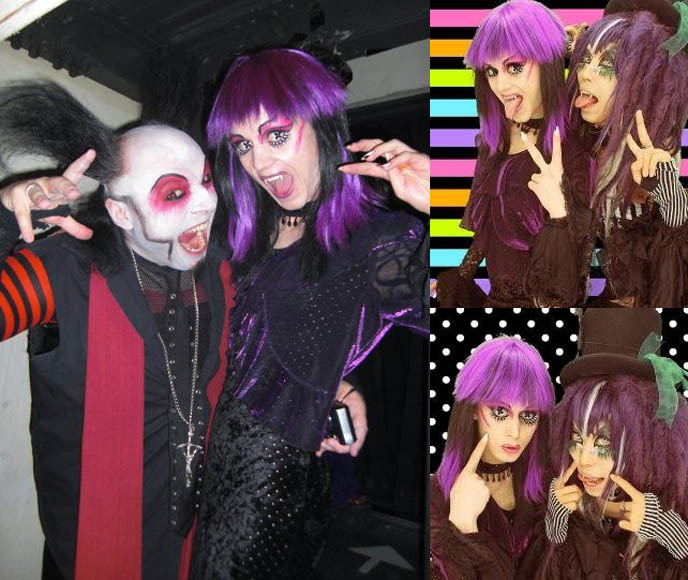 LA CARMINA TV APPEARANCES IN 2010, JAPAN KAWAII FOOD DOCUMENTARY. Happy New Year! 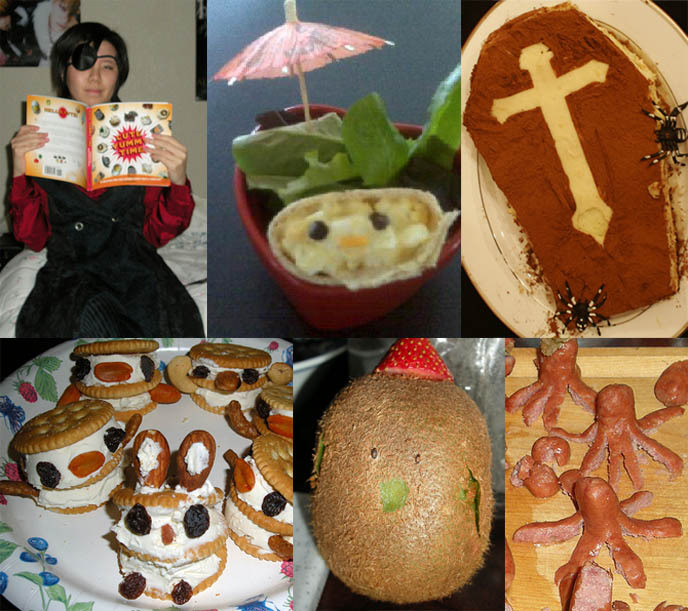 Thank you to everyone who bought Cute Yummy Time and sent me photos of the recipes they made. Siouxsie Law built a coffin tiramisu — it looks deadly delicious. The stylish Gari Ouji threw a Cute Yummy Time birthday party, where the guests made food inspired by my cookbook — what a great idea! Finally, Meg Tweeted to me: “Looook!! I made a baby bird egg salad wrap like @lacarmina !! Best cookbook ever. I love the book, got it for Xmas & can’t wait to try everything out! So kawaii! !” If you’re interested in finding out more about the book, click here. 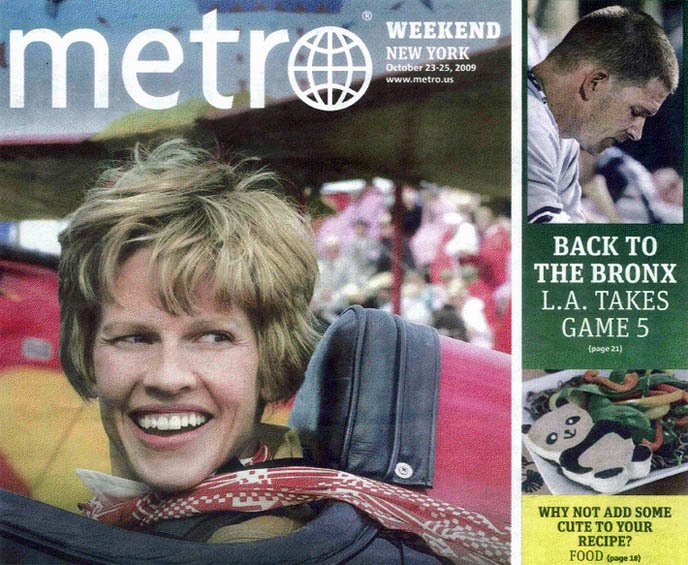 I’m excited about 2010… plans include more TV work and time in Japan! In May, French TV station Canal Plus will fly me to Tokyo to be featured in a 90-minute documentary. It’s part of an ongoing series that takes a surprising and subversive look at world capitals. And the host is none other than Antoine de Caunes, one of France’s biggest TV and film stars. 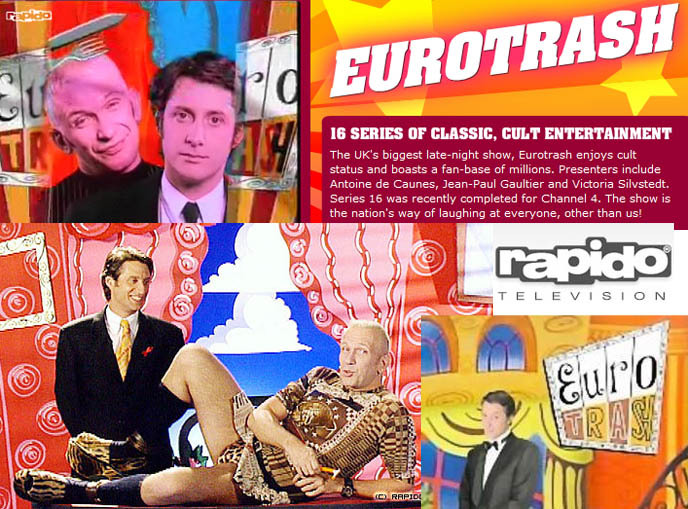 Perhaps you may know him from the hit UK series Eurotrash, which he co-hosted with Jean Paul Gaultier! So you can look forward to much more Tokyo Decadance (literally — we’ll be painting the town red with party organizer Adrien le Danois.) Of course, all my favorite Tokyo Spooks will be involved in the filming, like the Andrew Zimmern Bizarre World shoot (which will air this April). Next week, I’ll be in front of the cameras for a Japanese TV station, NHK. As I mentioned before, I’ll be the subject of a New York Wave documentary on cute food and character bentos. 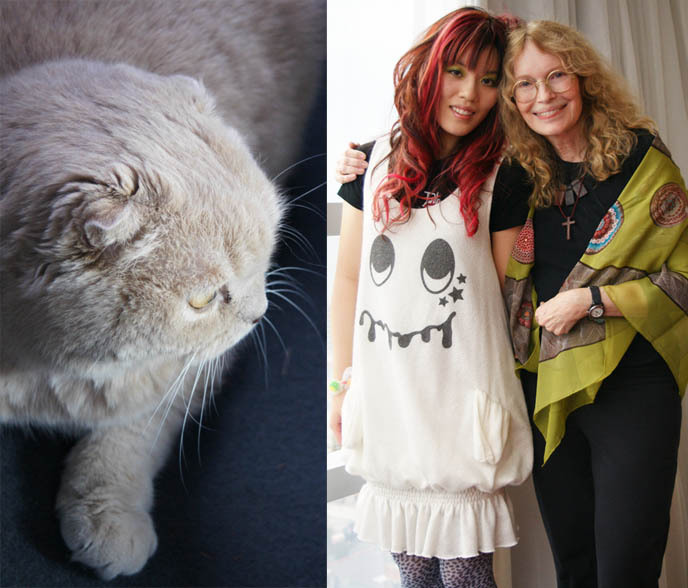 Hello Kitty and schoolchildren will be involved… yes! What else do I have planned for 2010? Quite a lot. I’m continuing to write about Asia pop culture/music/fashion/food for CNNGo (see all my articles here), and I want to get started on my next book project. There’s additional TV stuff in the works, which I can’t talk about quite yet… but so far, everything’s pointing to a green light. And the fashion collaboration will be revealed soon, so keep checking back. 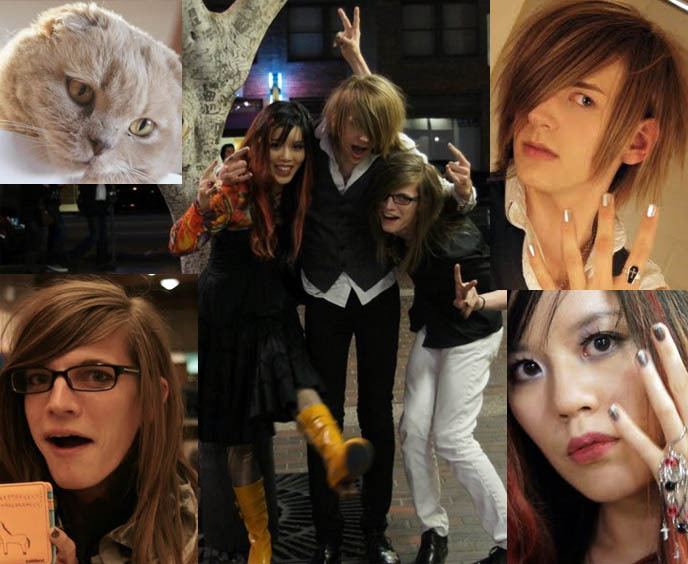 2010 is going to be a killer year of filming, friends, fashion, and flamboyance — can’t you feel the electricity in the air? Who’s coming along with me on the wild ride? 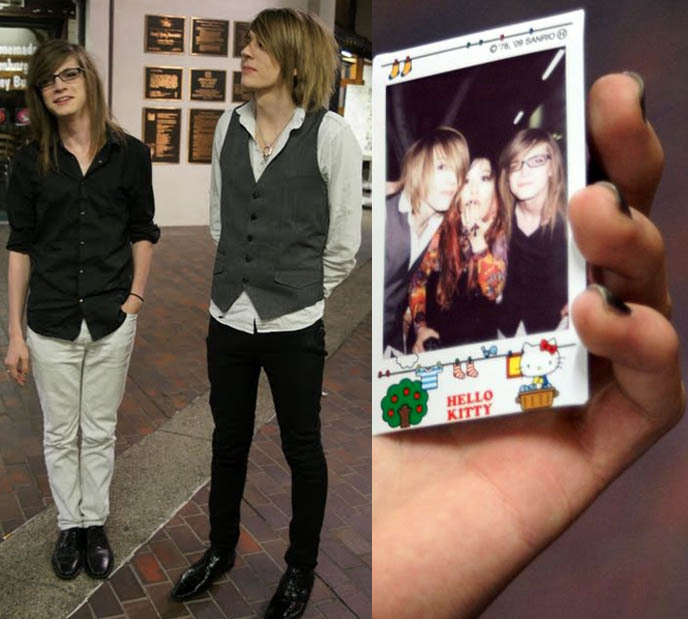 BIG NEWS: APPEARING IN NHK JAPAN DOCUMENTARY! CUTE YUMMY TIME RECOMMENDED IN WASHINGTON POST HOLIDAY COOKBOOKS GIFT GUIDE. I’ve been juggling projects recently, and something awesome was just confirmed… NHK, Japan’s national public broadcaster, is shooting a 20 minute documentary about cute cooking that will focus on my work and book, Cute Yummy Time! I’m currently brainstorming with the producer and director, so I can’t say much more about it yet. 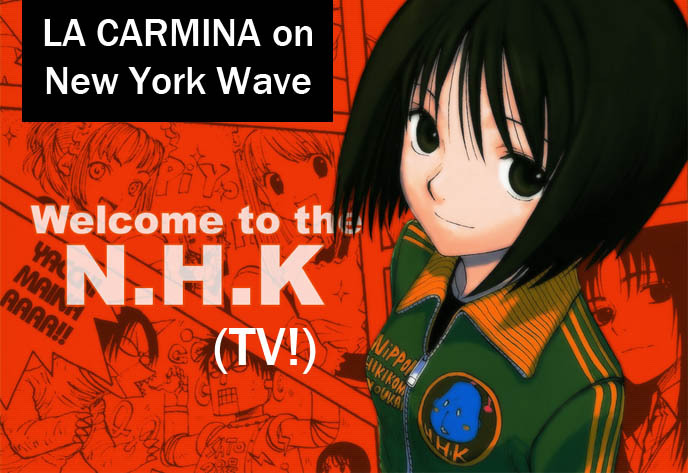 But NHK will be shooting the “New York Wave” episode in January, and it’ll air internationally (many US cities receive the channel). There might even be some way you can be part of the filming… I’ll keep you posted. Hope you’re enjoying the holidays! If you’re looking for holiday gifts, please consider my Japanese charaben-inspired cookbook, Cute Yummy Time — thanks for your continued support! 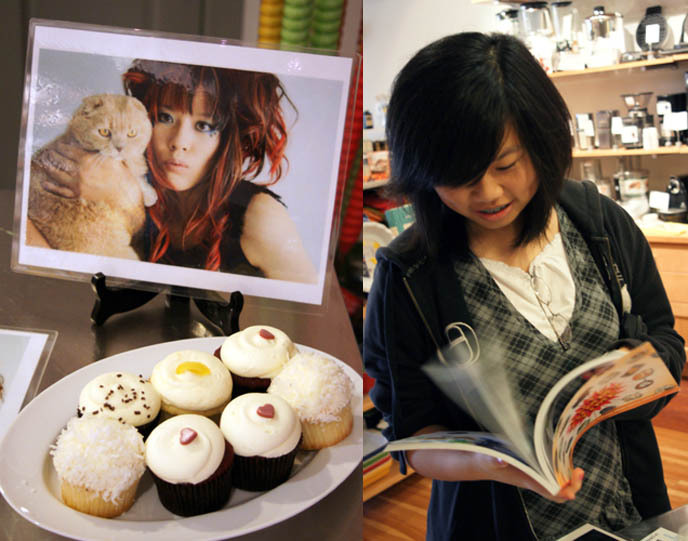 CUTE YUMMY TIME: NEW BOOK SIGNINGS ANNOUNCED IN LOS ANGELES! WASHINGTON DC AUTHOR EVENT, CUTE CUPCAKES & BENTO TOOLS. My family is originally from Hong Kong but I have relatives scattered all over the world, including Washington, DC. And so, my Cute Yummy Time book signing in the capital city turned into a mini-reunion with family — Basil Farrow’s father included. I fell in love with Hill’s Kitchen the second I stepped in. A bright, loft-like space filled with modern kitchen gizmos, with a studio for cooking lessons upstairs… ah, cute cooking heaven! The stylish Harukosama, who interviewed me about cool hunting/trend scouting, brought several boxes of Georgetown Cupcakes to the event. (What a sweetie!) The bakery is a DC legend, and deservedly so: the dark chocolate ganache was lick-your-fingers delicious, yet not too sweet; the lemon, red velvet and key lime flavors were perfectly balanced. Next time you’re in DC, swing by Georgetown Cupcake for a treat… or two, or three! 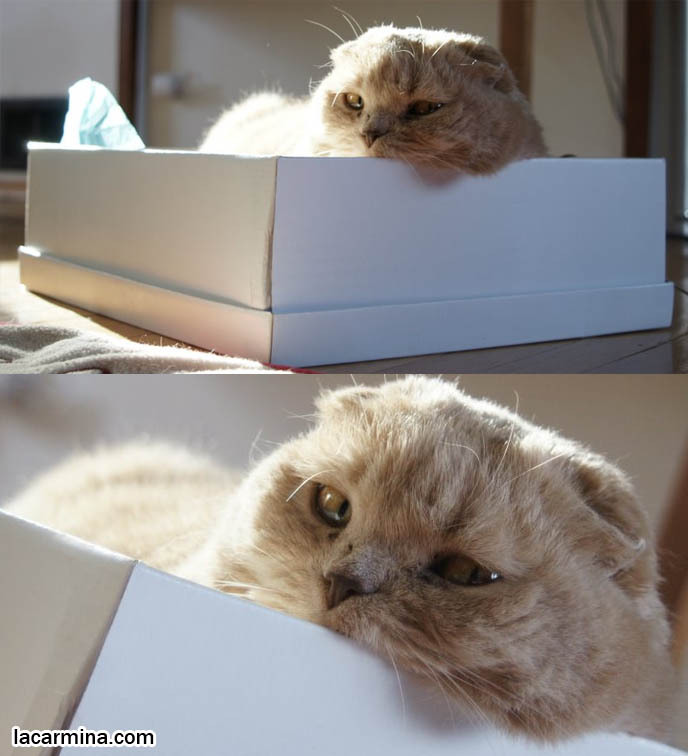 When I returned, my Scottish Fold turned on the cuteness and I took hundreds of new photos. You can see them daily on Basil’s blog, and I added a large batch to his Facebook (add him to see them: “Basil Farrow”). 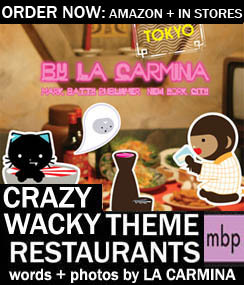 Announcing yet another Los Angeles book signing – this time for Crazy Wacky Theme Restaurants: Tokyo! Hope to see you there and at the November 28 and 29 signings at Kinokuniya LA. CUTE YUMMY TIME COOKING DEMO ON NBC TODAY SHOW! JAPANESE CHARACTER BENTOS, CHARABEN INSPIRED RECIPE BOOK FOR PARENTS, KIDS. A new day, a new video: my NBC Weekend Today Show appearance! 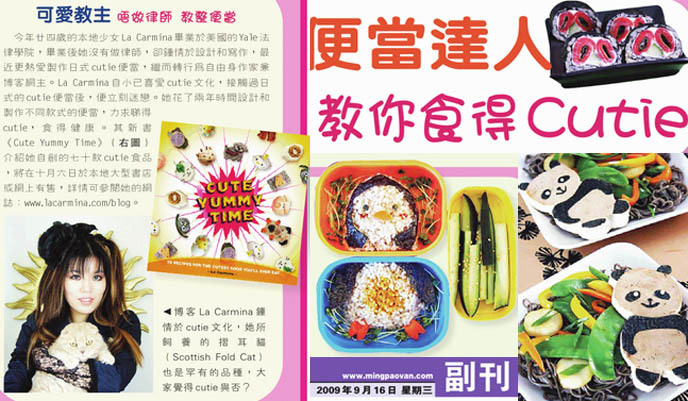 I talk about character bentos (charaben) in Japan and the healthy approach to cooking in my book Cute Yummy Time. 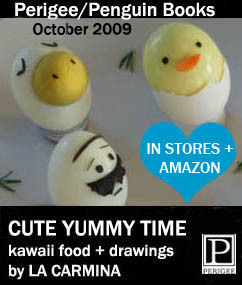 Then I demonstrate two cute food demos, which turn a fried and hardboiled egg into chick critters! For behind-the-scenes photos of the 30 Rock Today Show studio, check out this post. I invite you to subscribe to my YouTube channel as I have more videos in the works! Can’t wait for my LA book signings at the end of November (event details here). Hope to see you there. CUTE YUMMY TIME BOOK TOUR SIGNING DATES ANNOUNCED! 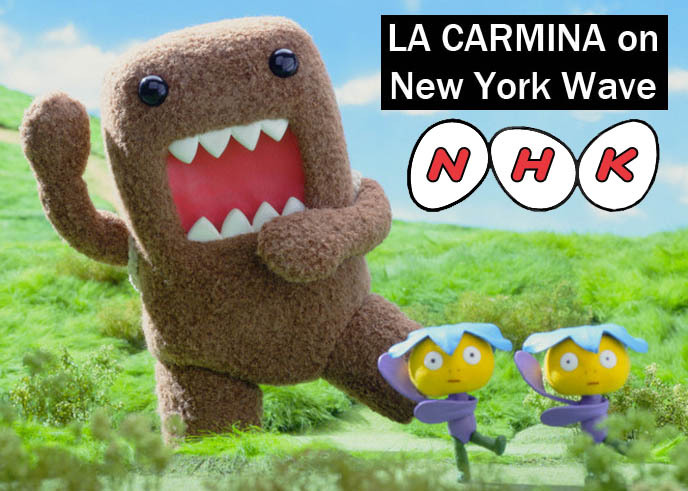 LA CARMINA COOKBOOK IN-STORE EVENTS IN NYC, DC, PHILLY. CUTE YUMMY TIME BOOK SIGNINGS!!!! Three tour dates announced so far in NYC, Philly and DC. I hope to see you there — I’d love to stay afterward to hang out with you! More US dates to be announced soon. More info about Cute Yummy Time here. Hope to see you soon (I’ll try to bring adorable snacks!). 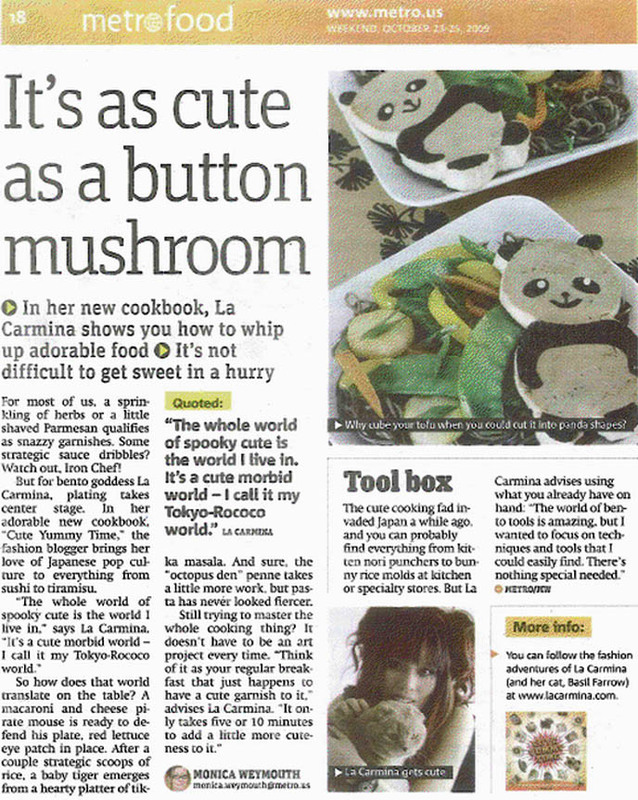 CUTIE FOOD: JAPANESE BENTO LUNCH BOX DECORATION RECIPES & CHINESE NEWSPAPER ARTICLE. 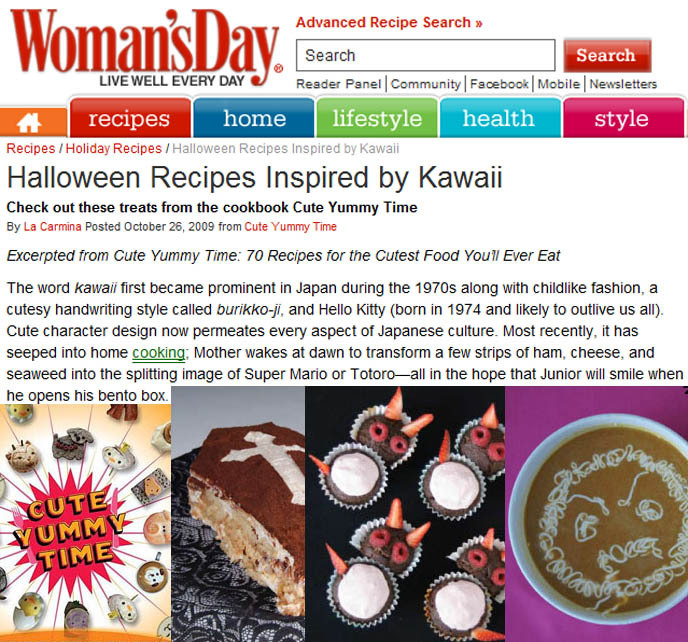 ASIAN COOKBOOK, CUTE FOOD JAPAN TREND. Ai-yah! 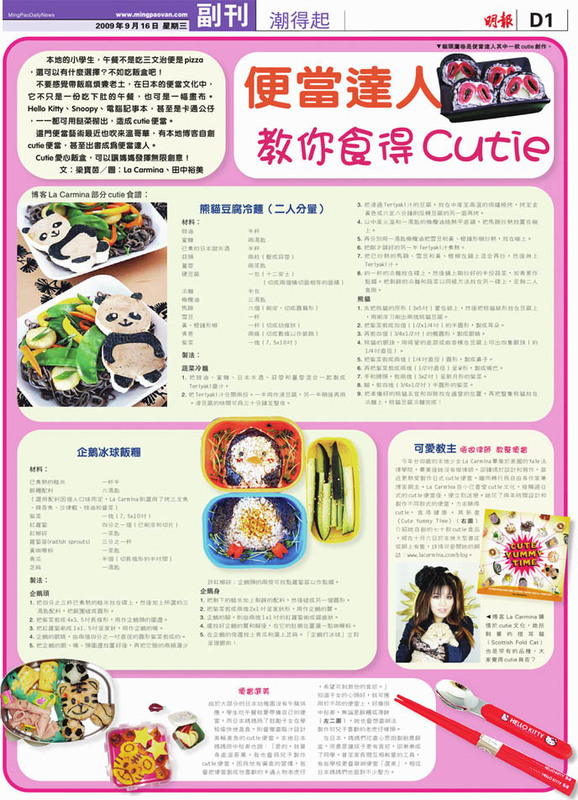 The Ming Pao, a leading Chinese-language newspaper, did a super cute feature on Cutie Food.The article includes two of mommy’s recipes from my cookbook Cute Yummy Time (brown rice penguin onigiri and panda tofu soba). And I make an appearance too! Below is a scan (click to enlarge) and translation. Funny: they translated mommy’s name, La Carmina, as 田中裕美 (Yumi Tanaka) — I wonder why! And Basil is called a 摺 耳 貓 (jip yee mao) — fold-eared cat!Cute Yummy Time is now available for pre-order here and will be found in all major bookstores after October 6. Local primary students are limited to eating sandwiches and pizza in the cafeteria, so they might as well take a box lunch to school. Don’t think this is an old school thing to do. In Japan, bento culture is not just about the food, but the picture. Hello Kitty, Snoopy, and other Japanese anime characters can all be made into a cute bento box lunch. This trend has spread to Vancouver, and local people are making their own bentos. There’s even a recipe book — Cute Yummy Time can encourage your mom to express her creativity. It’s written by author La Carmina. 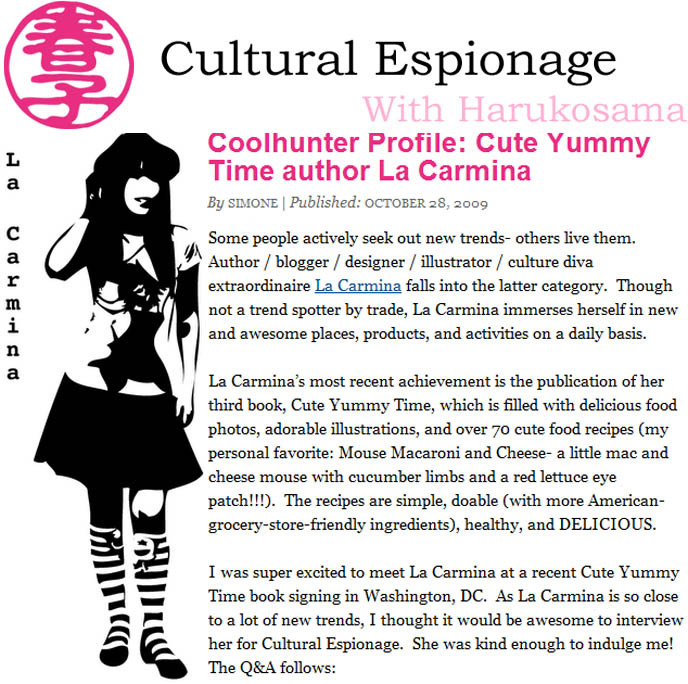 Photo caption: Blogger La Carmina loves cute culture. 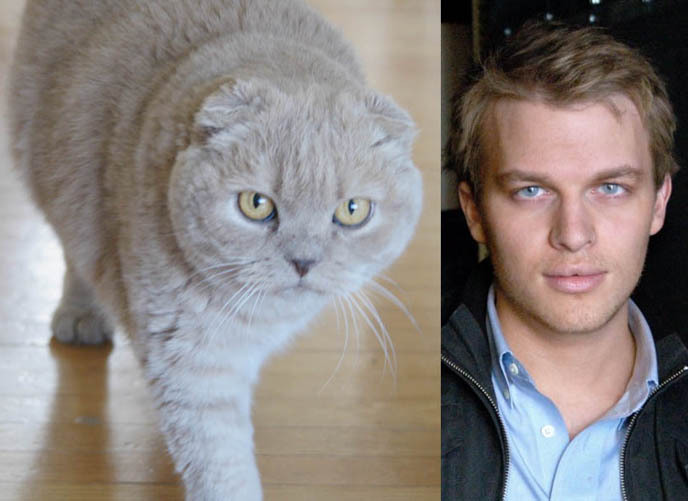 Her cat is a rare breed (Scottish Fold). Do you think he’s cute? The recipes for the panda tofu soba noodles and penguin rice balls are found in my book Cute Yummy Time.